I spent the day in Salt Lake Shops, dropping off the latest issue of the New Century Collector, and snapping a pic here and there, but nothing really caught my attention until I stopped by The Old Flamingo, one of the Valley's newest shops, located in East Millcreek. It was grand opening day for the stylish co-op, and event organizers Missy & Peter Coombs know how to put on a party. Working my way through a sea of pink yard flamingos to the entrance, I found myself feeling a bit like Odysseus, steeling myself against the Sirens, diverting my eyes from the impressive array of goodies and refreshments, Safely inside, I discovered that the festivity's were less egocentric than most of these affairs. While the co-op members were proudly showing their wares and enticing customers with a sale, it was clear that highlighting local artists and raising money to support the Tracy Aviary was more than an afterthought. Strewn throughout the shop were plastic pink yard flamingo's which had been decorated and embellished by artists from Millcreek Artspace. I had intended to share them here, but when I later unloaded the camera, I discovered that I had bumped the settings nob, and what I had was something resembling the way I remember the 1960's. Nonetheless, the flamingo's were fabulous, and were sold by silent auction, with the proceeds, along with a percentage of each sale at the co-op going to the Aviary. The day ended with a children's parade which marched through the next door Millcreek growers market. Kudos to Missy, Peter, and the other vendors at The Old Flamingo. You'll want to visit this fun shop filled with trendy restored, re-purposed and interesting vintage furnishings. Good stuff and good people. Located in East Millcreek at: 3474 so. 2300 E., they open Monday through Saturday 11:00 to 7:00, and until (:00 on Thursdays. 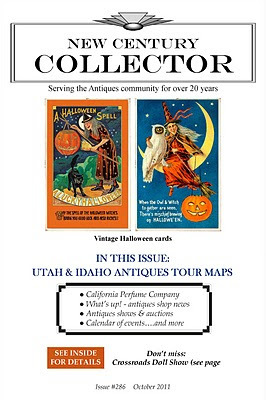 THE NEW CENTURY COLLECTOR OCTOBER ISSUE! Even cooler than hot of the press! 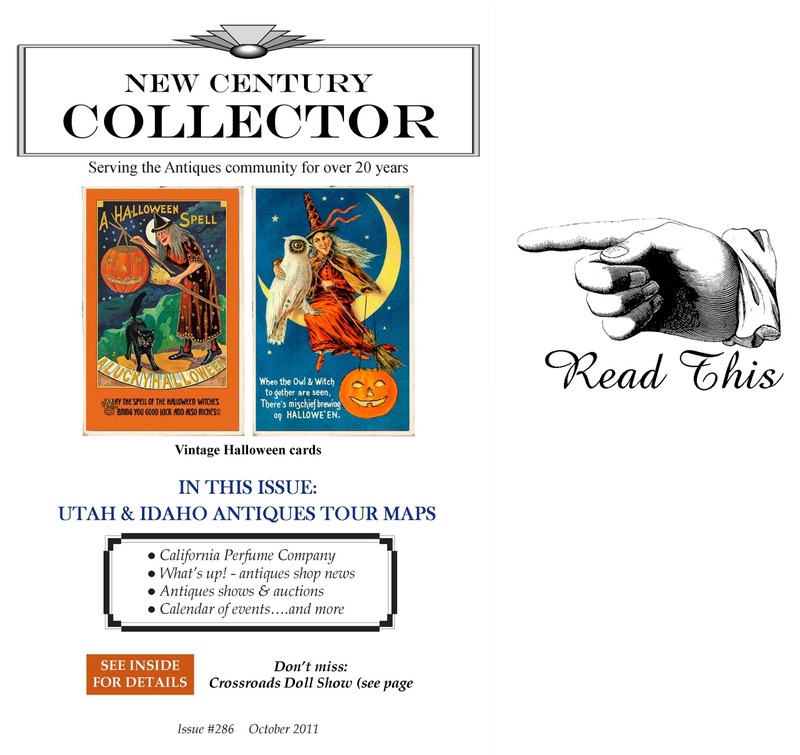 Be the first to improve your life by reading the latest issue of the New Century Collector. It will be in shops by Friday, but if you'd like an early look, you can check it out on our website: Word has it that early readers get the worm. 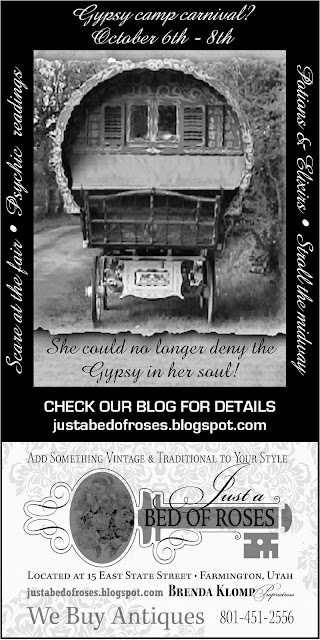 Gypsy's have been reported foraging around Farmington! I hear they're camped at Just a Bed of Roses, who have apparently been leaving food out at night. I hope Brenda knows what she's doing. Well, what can I say about Gypsy funk, the cryptic fall promotion at Bed of Roses in Farmington. Intriguing. October features their Gypsy camp carnival, an open house subtitled “scare at the fair”, featuring potions, elixirs, psychic readings and I presume just plain fun. You couldn’t keep me away. Is there something in the water in Logan? Antiques and amore' seem to go hand in hand up in Logan. About a month ago, I was in the Browse Around Antiques Mall, and there was a lovestruck customer inquiring about video taping a proposal to his prospective bride. It seems they had met at Browse Around, and now spent much of their time hanging out there (presumably in the darker nooks & cranny's). Now, Greg & Bettie Marble of Browse Around and Connie Tibbits of About Time Antiques Mall are having a joint promotion in October, called "Friday date night". 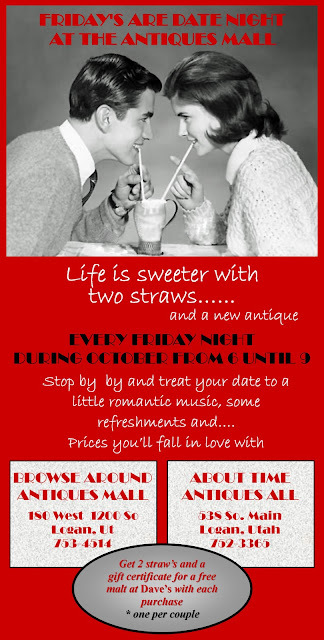 The promotion is simple; using the tag "life is sweeter with 2 straws", every Friday night during October, the shops will set the mood with a little romantic music, and some refreshments, and each couple that makes a purchase will get 2 straws, and a gift certificate for a malt at a local ice cream establishment. Sounds perfectly love-ly to me. I know 3 things, I can get a date, I'll have no trouble finding an antique I want to buy, and Lyn and I can kill a malt with 2 straws without breaking a sweat. Looks like I'll be heading up to Logan one Friday in October, see you there. Whose gonna spring for this? I don't know about you, but it seems to me that there should always be somewhere to get your daily antiques fix. Especially on Sunday, as many view antiquing as more of a religion than hobby. Included in the first group, I found myself nosing around Expressive Bungalows Sunday outdoor market. It was a great day for shopping, pleasantly warm and sunny, it seemed more like spring than fall. What makes Expressive Bungalow owner Nancy Blaney's market a bit different, are the extras. The mood is festive, and you can not only feed your soul with a little shopping, but also feed your mind & body with some terrific food & music. Since she had spent the night, we decided to take my grand daughter Sarah Lyn to the sale with us. Named for my wife, it didn't take long to discover that she would be following in her grandmothers footsteps. Lyn, working her way towards Nirvana, meandered from booth to booth looking for religious artifacts, and, I noticed Sarah Lyn following along, working the sale like an expert. I'm sure that one of these days, this pair is going to be more than I can handle. Here's Lyn giving my grand daughter a few tips on how to make the deal. And here's my favorite shot of the day. Lyn discovering that there are consequences to taking someone shopping. She looked at me, but I shrugged it off, and went for something to eat. All in all, a great morning. Food, music and shopping, all on my wife's dime. Now, I'm in Nirvana! The best news is that Nancy's planning another outdoor market on Saturday October 22. Drop by and join the fun! There must be something in the air in Northern Utah. It seems every time you hear about a new shop, chances are it's up in the Ogden to Logan area. The latest news is from Lance Lewis shop, The Estate Sale. Already the biggest place to shop for antiques in Ogden, this shop which has only been open for a few months is already growing. Lance will be adding another 2000 square feet and several new dealers by the first of October. Here's a taste of what's inside. 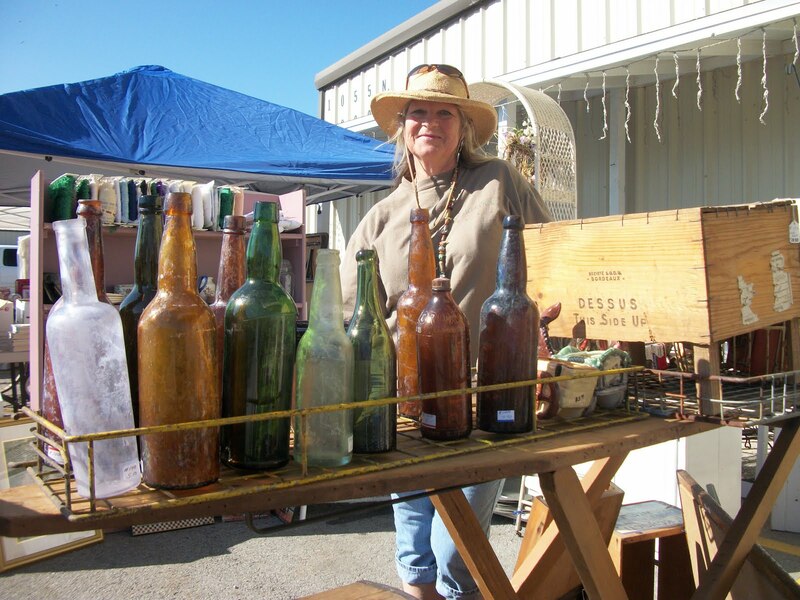 There's not too much warm weather left in our futures, so you might want to head up to Ogden on Saturday October 8th and bask in the good weather and antiques at The Estate Sale's Outdoor market. If you want a space to sell at this event, it can be had for a miserly $10 bucks. Can't beat that! Give Lance a call @ 801.940.4075 Hope everyone has fun, I won't make this one, Lyn tells me it's our 42nd anniversary, and I better have other plans. I stopped by Nancy Blaney's Sugarhouse shop Expressive Bungalow, this afternoon, to get a few new pic's for the Collector. It's not hard to find something to shoot in this upscale consignment shop. As usual, the place was packed with goodies. Take a look at what I found. That over sized Cowhide & leather arm chair could be that unusual piece you've been looking for. On another note, you won't want to miss Expressive Bungalow's open air market on Sunday, Sept. 25th. The parking lot will be filled with antiques, collectibles & stuff, and, you can even grab a bite to eat. I can smell the hot dogs & bargains from here. Nancy tells me she still have space for a few vendors, If you want to spend Sunday afternoon outside in the sun, and make a couple of bucks, call Nancy @ 801.487.7600 and reserve a spot. Things should be hopping at here great Highland Drive Location (2903 So.). Hey, is that really half off! 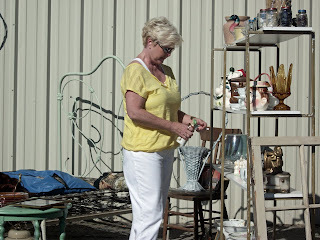 This past Saturday, I stopped by Treasures Antiques Mall in Springville, to snoop around their semi-annual parking lot sale. As always, vendors had shown up with the good, the bad and the ugly. So, the hunt was on; We couldn’t ask for a more beautiful morning for shopping, so Lyn and I walked around and uncovered a treasure or two. We later discovered that there was a big bonus that came along with the outside market. When the Antiques Mall opened for business, we found every booth was offering their wares at 20 to 50 % off. One step closer to Nirvana. That's my Friend Rosemary Mcaffee, who has space inside Treasures, hocking some of her goods outside in the sun, and above is my wife Lyn, having a religious experience.